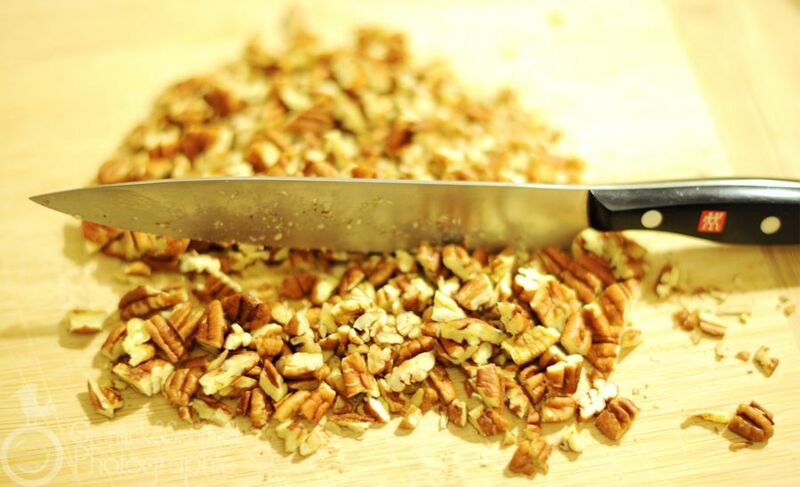 When you read about pecans on Wikipedia, you’ll learn that the original word is from Algonquian (a native language spoken in the territory of what is today known as Canada). It literally means “nut requiring a stone to crack”. Ah, I can think of a couple of “nuts” that would fit this description (and now I’m curious about the Algonquian word for “nut that cannot be cracked, not even by a stone”) – but I digress! If you continue to read up a little further on pecans, you’ll find out that they’re an excellent source of iron and B-vitamins, two things you can never eat enough of if you’re on a vegetarian diet. I knew I loved pecans for a reason! 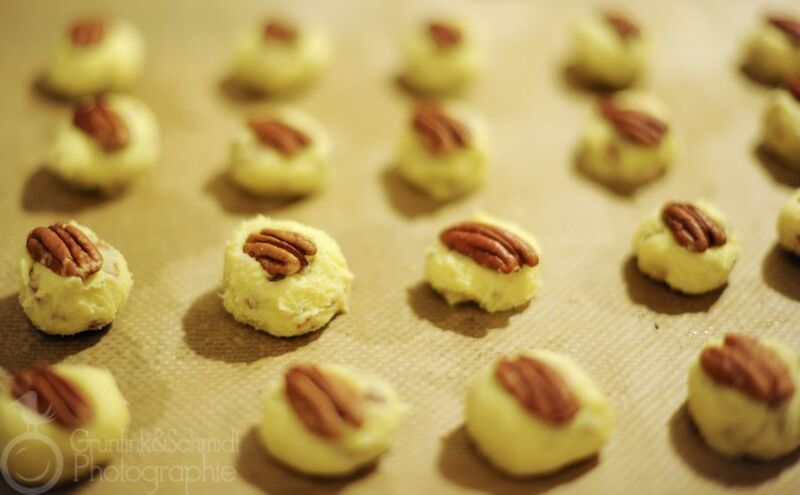 And of course, I had to make cookies out of pecans! These are probably my favourite cookies from this year’s batch of Holiday cookies. Ok, all of them were pretty good, but these I particularly enjoyed, because they were sorta new. If you can afford it (pecans are kinda pricey after all), feel free to add more chopped pecans than the amount specified in the recipe to your cookie dough. It’ll be extra nutritious and even more delicious! If you’re on the chocolate-y side, you’ll consider adding tiny chocolate drops (pick them more on the bitter side), too. I’m sure this would be pretty amazing! Heat your oven to 160°C (if you have hot air circulation in your oven, you can turn it on and place a small fire-proof bowl filled with water into your oven, preferably onto the bottom). 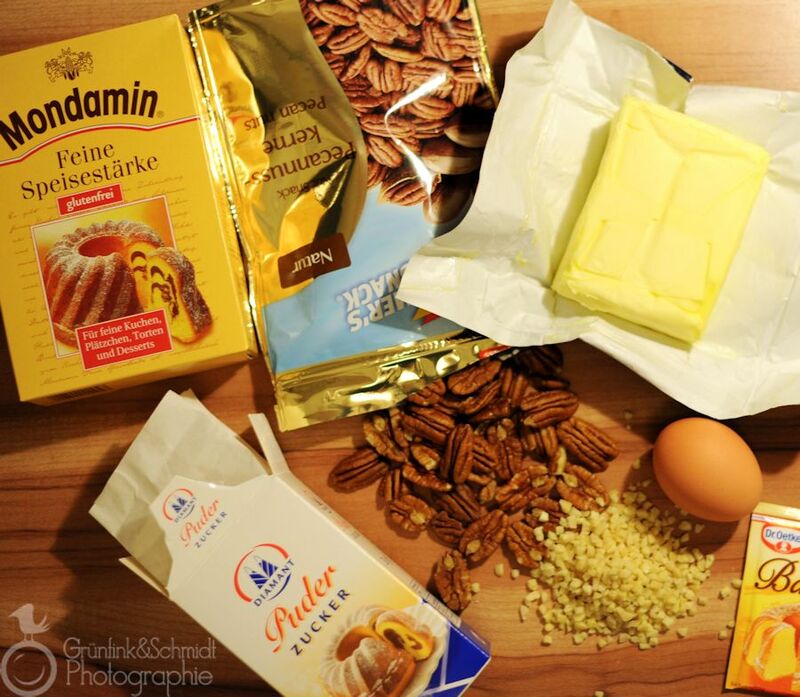 Place the butter in a bowl and whisk with your handheld mixer, add the egg after about three minutes, then add the powdered sugar, the vanilla essence and ground almonds. 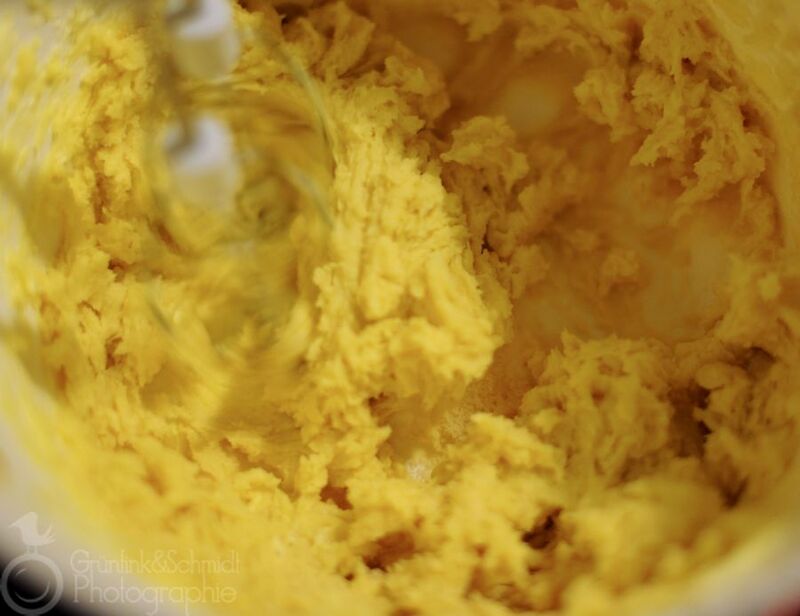 Place the gluten-free flour, the corn starch, baking powder and salt in a separate bowl and pour into the liquid ingredient mix. 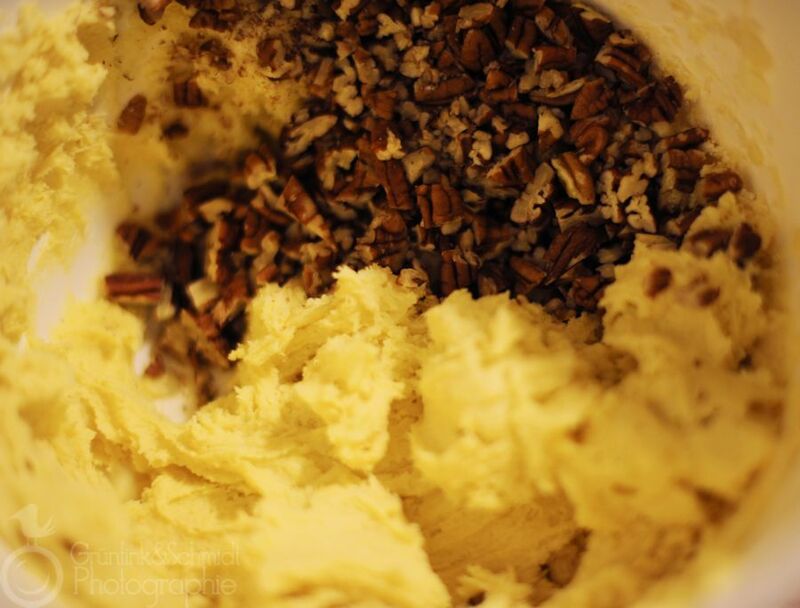 Add the chopped pecan carefully by kneading the batter with your hands. Proceed to form tiny scoops of batter (about the size of a small walnut) and place onto the baking parchment. Repeat with the remainder of cookie dough, leaving sufficient space between cookies (about double the size of the cookie itself) until the entire baking tin is lined with cookies. (You should always use a cold baking tin for this stage of the recipe, otherwise your cookies will melt. 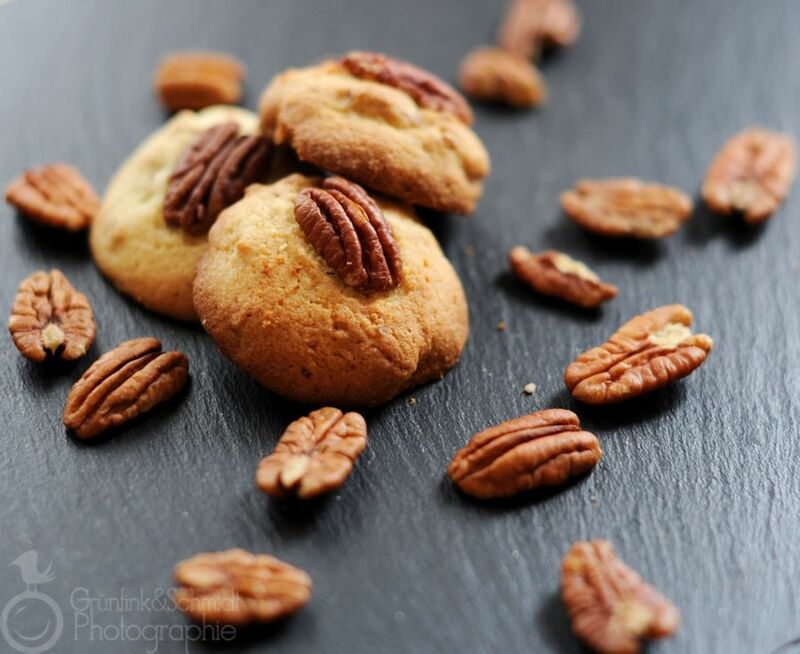 If you find your cookie dough is too warm and thus too hard to handle, refrigerate for ten minutes and then try again) Gently press the pretty pecan halves onto your unbaked cookies and place baking tin into oven, where they should bake until golden brown at the edges (about fifteen minutes). 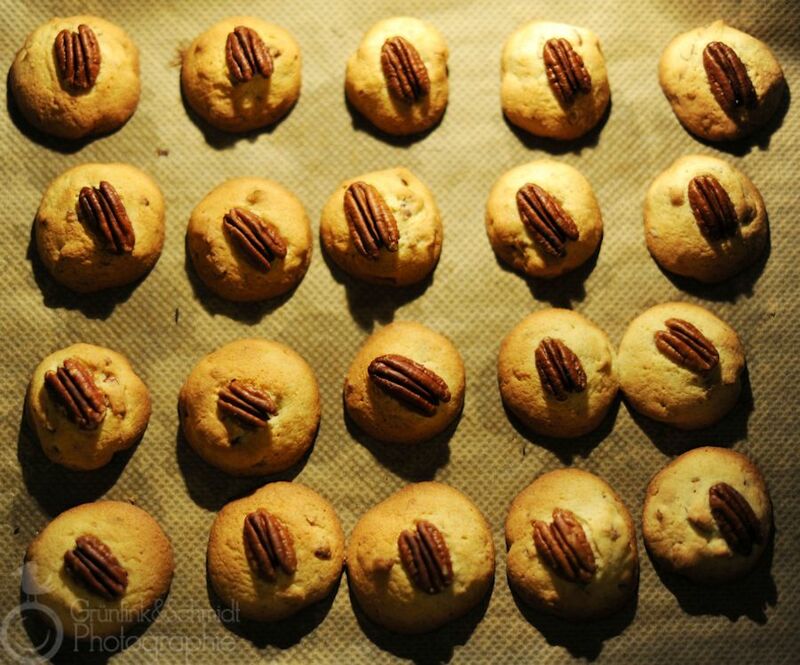 Remove baking tin from oven and allow pecan cookies to cool off entirely (e.g. by placing the baking tin outside if your home allows this) before removing cookies and placing them into a cookie tin.